Clean rooms, secure property, reliable and trustworthy service- that is our guarantee. 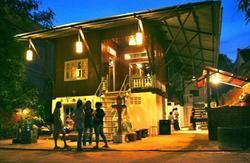 Downtown Siem Reap Hostel is a hostel with high standards, but with backpacker and flashpacker prices. British owned and managed, and established in February 2011, Downtown Siem Reap Hostel has become one of the most popular hostels in Siem Reap, and now with a newly built swimming pool, bamboo gardens, and extra rooms, we are able to accommodate and serve 50 guests per night. 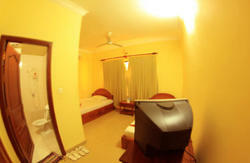 Our accommodation includes cheaper fan dorms, AC dorms, twin and double rooms, 4 person rooms and deluxe family rooms (Feb 2013). Our kitchen is open from 6.30 am- with a cheap backpacker menu with all eats under $2.50, to Thai food and Western food- something for all budgets. Our breakfasts have always been a big hit, with set-breakfasts including tea/coffee and juice from $2.50. Our popular bar is open throughout the day until late - of course staffed by western staff. We are open 24 hours a day - we never close! Our success is due only to the shear dedication of the Khmer staff employed here. 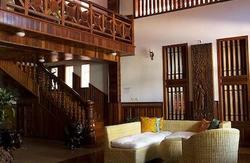 They speak excellent English, serve with a smile, and are here to make your stay as comfortable as possible. From the Old Market, follow the bridge over the river, 1st right past the hip hop club on your right, then follow the road for 100 meters, bear left past the BBQ beef restaurants on your right. We can be found on the right after 50 meters.